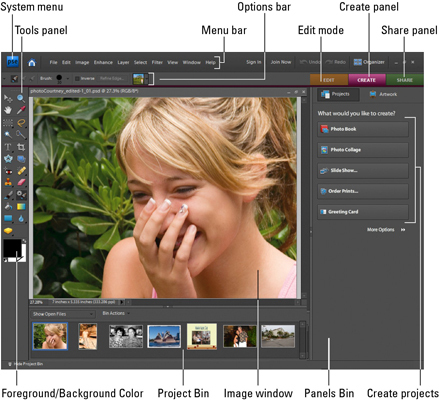 Photoshop Elements 5 offers every tool you need to process, pick at, and play with your photos. The Photoshop Elements workspace is your access gate to digital manipulation; and a host of keyboard shortcuts help you handle your editing and enhancing tasks with ease. 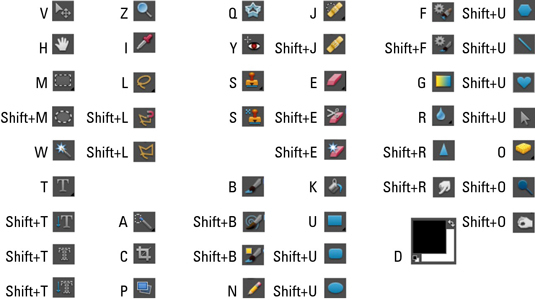 The Photoshop Elements 5 toolbox offers keyboard shortcuts galore. Get to know Photoshop Elements 5 shortcuts by the visual icons that clue you into their function. For example, if you want to zoom in, look for the magnifying glass and the Z key; to grab something, the H and hand icon are what you need.